Roof hail damage in Denver may not be visible from the ground. It may not show up until months after the storm. But you can be sure it will lead to leaks and structural problems if undetected. Get our professional inspection and repair service, now. • The Front Range has the highest concentration of large-stone hailstorms in the U.S. and when compared with most of the world. • Colorado can usually count on three or four catastrophic events each year. • It has caused more than $3 billion in insured damage in Colorado over the past decade. 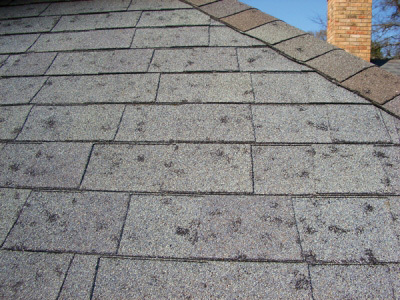 When it comes to roof hail damage in Denver, you can’t completely avoid risk. But as an experienced roofer, we can diagnose and repair it. Trust us to recommend only what you need – spot repairs or replacement with a more durable surface. We have nearly three decades of experience helping Hail Alley residents to protect their homes. Hailstones can travel up to 90 mph. • The stones will scour the protective granular surface off of asphalt shingles. • Larger stones can crack tile and slate, inviting leaks. • They can dent metal surfaces and flashing, damaging some joints. To an untrained eye, from the ground, the surface may appear untouched after a storm. You might not spot problems in the roofing materials. We suggest that you look for less obvious signs of distress. • Inspect your gutters, metal mailboxes and nearby cars. If they have dings and dents, your roof might also. • Check for piles of tiny dark chips or sand-like grains around gutter downspouts. This may indicate erosion of the protective granules on asphalt shingles. • Look for dark spots, discoloration or holes in your ceiling. This is a good indication of a leak. Up to half of your insurance premium may be going toward hail and wind coverage. Knowing how to deal with your insurance company is critical to getting problems addressed quickly. As a veteran contractor, we have longtime experience handling insurance claims for homeowners and businesses. Call now to have your surface and your policy assessed by our experts. • Without a professional examination, there is no way to tell. • If you need, or desire, a replacement, we offer shingles or tiles designed and tested by Underwriters Laboratories to resist impact. • Expect the expert installation you need for peace of mind. That’s right – four hundred percent! The insurance industry reports this astounding increase in unscrupulous companies that go door to door. They take your money, and either don’t do the work, or do a poor job. Then, of course, they disappear. “Storm chasers” don’t just find you; they target you, often leaving urgent-sounding door hangers after a storm. • They usually have toll free (800 or 877) numbers. Look for a local number. • They tell you that your insurance will pay for a full roof replacement. There is no way to know that without an inspection and a discussion with your insurer. • They will always tell you that you need a new roof ASAP. Often, you won’t. Call us for an honest answer, from a local contractor known for integrity. We are a licensed roof contractor with an excellent reputation, providing a five-year workmanship warranty on all jobs. We have been family owned-and-operated since 1984, and proud of our membership in the National Roofing Contractors Association, Colorado Roofing Association, and the Better Business Bureau.